Growing up Protestant and Republican in Kansas, I began life as a political conservative. But when I was in college, John F. Kennedy changed that. He and Pope John XXIII opened the door to the Catholic Church for me, and for most of my adult life I considered myself a Catholic political liberal. I am still very much a Catholic, but my political leanings have changed again. I no longer consider myself a liberal—or a conservative. When the U.S. bishops issued their peace pastoral, “The Challenge of Peace,” in 1983, I found great comfort in it. Having been born into an old Mennonite family, I no longer felt I was a traitor to our centuries-long tradition of absolute nonviolence. I began writing about the pastoral for the archdiocesan newspaper in Washington, D.C., and that eventually grew into a syndicated series of weekly columns entitled “Making Peace,” published nationally over the next eight years. The columns were an experiment, and an honest one, since I had no idea how the process would turn out. My mentor and colleague John Howard Yoder looked over my shoulder from the University of Notre Dame theology department, commenting frequently, asking whether the absolute nonviolence we had both inherited from our Amish and Mennonite ancestors could be reconciled with the newly articulated Catholic position. Also judging the columns each week were dozens of diocesan editors who would decide whether to run them. And looking over their shoulders were millions of Catholics who had served in the military and whose family members had also served. Three years later I helped organize a group of U.S. Catholics for a visit to Catholic churches in the Soviet Union. That trip ended in Poland, where one Saturday afternoon we visited the church in Nowa Huta near Kraków, constructed when Cardinal Wojtyla, later Pope John Paul II, was its bishop. It is a stunning theological statement in concrete. We asked a parishioner preparing his great church for Mass how it could have been built in a new city planned by Communists, and he looked at me with astonishment. To him the answer was obvious. “We told them we wouldn’t work if they didn’t build us a church,” he said. The next year the Berlin Wall came down, and Poland became free. When that happened it became clear that many of the things we had taken for granted during the cold war had been based on myth, not reality. The consensus position in the liberal community had been that the Soviet Empire was here to stay, and the most we could hope for was to get along with it. We regarded the conservative position—that Communism was a great evil that had to be defeated—as blindly militaristic and almost certain to produce a nuclear holocaust. But neither did the evidence support those who believed the Reagan military buildup had caused the empire’s collapse. Their critique of the liberal position—that we had been prepared to let Eastern Europe endure an endless unjust occupation so the West could enjoy a false peace—did, however, gain new credibility. The evidence since 1989 indicates it was Solidarity that brought down the Soviet empire, and that it did so with very little support from the West—left or right. What was it that had so completely blinded us to what was actually happening in the Soviet Union? Why hadn’t we supported Solidarity and similar movements throughout the Soviet Empire when we had the chance? What were we thinking? It has become increasingly clear to me that what got in our way was a commitment to ideology, shared with equal fervor across the political spectrum. The left and the right obviously had different ideologies, but we all believed that some single idea would produce solutions to these problems, even before we knew precisely what the problems were. The U.S. Catholic bishops’ pastoral letter on peace also had a major political impact, almost certainly helping to end the cold war. It was a significant use of hierarchical power, possible because both Cardinal John Krol and Cardinal Joseph Bernardin—one widely regarded as a conservative and the other as a liberal—joined in supporting the effort. 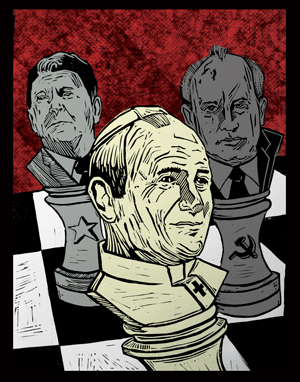 The U.S. Catholic bishops no longer have the political influence they had in 1983. And they will not regain it until they are able to advocate positions that Catholics on both the left and the right can support. U.S. Catholics themselves are currently in danger of becoming as politically divided as the nation. Both liberals and conservatives were wrong about the cold war, and those of us who aligned ourselves with either side are now embarrassed. What reason do we have to believe the positions now being taken by either the secular right or the secular left will embarrass us less 20 or 30 years in the future? There are three options open to us, not just two—left, right and Catholic. The options offered by both the left and the right are based on ideology. The Catholic option is based on realism—the careful and patient discovery of facts and the search for policies based on both facts and on the Catholic imperative to preserve and enhance the common good. Catholic and centrist are not the same; we do not achieve the common good by splitting the difference between competing ideologies. We achieve the common good by finding and advocating solutions to the real problems of real people living in the real world. Despite a widely expressed desire to end the partisan gridlock that now paralyzes American politics, it stubbornly continues and grows. And despite the U.S. Catholic bishops’ regular pleas for a new politics based on human rights and the common good, Catholics have been unable to offer a national alternative to the political warfare now taking place. Instead, we have contributed to it. Both those bishops who have openly identified with the political right and those who disagree but have remained silent have equally contributed to a widely held public perception that the Catholic hierarchy has joined the right-versus-left battle on the conservative side. Rather than becoming a moderating force in the civil war of ideas now taking place, we have allowed the secular political establishment to set the agenda for political debate within the Catholic Church itself. One does not have to be a theologian to see the defects in that development, nor a political expert to see where it will lead. What is the alternative? What are politically active Catholics to do when our real choice is between reality and ideology, not between conservative and liberal? After a lifetime of struggling with these issues, I am convinced the greatest contribution U.S. Catholics can make is to organize coalitions of citizens—both Catholic and non-Catholic, conservative and liberal—to develop nonideological solutions to our major political problems and then to advocate them effectively. Elected officials have attempted to do this in recent years but have routinely failed because they are completely dependent on the system they seek to reform. Sick people are seldom able to heal themselves; the same is true for sick political systems. We have two major political successes to guide us—the civil rights movement of the 1960s and Poland’s Solidarity movement of the 1980s. In both cases great armies of citizens banded together to produce seemingly impossible changes. Both formed around a nucleus of deep Christian faith, in one case Protestant and in the other Catholic. They were two of the most successful and defining political events of the 20th century, but they represent an unfinished revolution. Neither of these great dreams will become a reality unless we form new political institutions able to provide alternatives to the current right-versus-left ideological conflict. What form these new institutions will take is unknowable at this point, but it is almost certain they will emerge. American democracy will not survive unless we find new post-ideological ways to conduct our political affairs. Regardless of how we Catholic voters choose to exert our political power in the future, it seems clear we must do something more than choose between the unsatisfactory options offered us by the existing political parties. It is hardly consistent with the Catholic tradition to let those who do not share our values set our political agenda. It is even less Catholic to stand on the sidelines criticizing what others do, especially when we offer no alternatives. Democracy thrives on new ideas. Let us offer some. A Very insightful and necessary writing to begin a new era in Catholic thought after an election which satisfied only half of us. Church teaching is a powerful thing when people allow it to form their conscience. This gives the Holy Spirit the chance to inspire each of us to be united in our thoughts about what is the best political choice for all of us at this point in time. What the Spirit does later to inspire us may result in a different decision but which expresses His choice for that time because our conscience is properly formed then also. This only works if we note that GOD IS IN CHARGE at all times and that God chanpions the most vulnerable at all times. Perhaps that is what happened this time. The Holy Spirit got through to the majority of Catholics for the sake of the most vulnerable. Next time the way to do that may be fifferent. Before the next time Catholics should really center any new ideas of what being Catholic means to include the true principles of its Social Teaching into its New Evangelism, including using principles of the true meaning of Subsidirity. America always needs that kind of thought . Thank you so much for a very thoughtful article. It is clear that you have wisdom born of long experience and reflection. And I very much agree with your answer to the divide in Church and Nation. The way forward is not through ideology, but through the practical application of the values we hold dear as Catholic Christians—the common good, compassion, truth, and discipleship. I wonder if you can explore, maybe in a furture article, what was uniquely Catholic about the Solidarity movement in Poland, and what is uniquely Catholic about what our community can bring to the split between "left" and "right" in our country. And what has happened to the Solidarity movement in Poland? Did it bring about a transformation of society and then cease to exist? Is it an ongoing movement within Poland now? My unexpert read on things is that the Catholic Church has much less influence now than it did in Poland under Catholicism. If it's ploitical influence has declined, Is that a sign of victory? What is he role of the Church now? I think we may be able to learn something about the challanges we face in the U.S from the full experience of the Polish people, before, during, and after Communism. Ivan, I truly appreciate your perspective. I am a post WW2 person from a working class family who began in the coal mines outside of Pittsburgh and have witnessed a great deal of struggle among those who are thought of as "less than", throughout this country and the world, for the validation of being people of worth. This seems to be the basic violence of human interaction and the foundation of human conflict. Those who have appear to desire to prevent those who do not have an opportunity for the freedom to pursue a life which gives one a sense of purpose and meaning. There are many different insidious levels of interpersonal violence which need to be identified and remedied through the actions of solidarity. In order to solve the great economic malaise we live in, and provide for justice and peace for all peoples, there is an issue that needs to be addressed by all people of good will. That is the issue of Land. Questions to be addressed would be: How did we get title to the land that we have? What is the mechanism that is used today to determine who has access to land? What role do land speculation and land profiteering have in the course of economic development? What role does inequality in access to natural recourses have in the tendency to war? In 1879, an American journalist, Henry George, wrote a book “Progress and Poverty” asking the question “Why in this time of great industrial and technical progress is there an increase in the number of poor?” His answer was that private ownership of land, with its tendency for the large land owners to become even wealthier without any effort on their part, and that they were capturing a great part of the wealth due to workers. His solution was a tax shift: eliminate taxes on work, and shift them to land value. Rather than a tax, this would be dues to the community that a person who has received the privilege of excluding the rest of the community from their land claim, for that privilege. This tax shift has been used in some cities in the United State, mostly in Pennsylvania, but also in Australia and South Aftrica. The result has been the reduction vacant properties, because it becomes expensive to maintain them, so they are developed, creating housing or job opportunities. Unfortunately, most proposals to create jobs overlook this important aspect. What can we do to introduce this to the community of decision makers? A “preferential option for the poor" should be maintained in our Catholic Schools. If we find that we cannot afford to keep our schools open to the poor, the schools should be closed and the resources used for something else which can be kept open to the poor.We cannot allow our Church to become a church primarily for the middle-class and rich while throwing a bone to the poor. The priority should be given to the poor even if we have to let the middle-class and rich fend for themselves. Thank you for this very cogent and honest explication of American history, religion, and politics. But mostly, I want to thank you for your suggestion that there may be hope for a new understanding among Catholics and others about what God calls all of us to work toward, Peace on Earth. Yours is an important essay that I hope many people will read and take to heart. I wonder what my part might be. Thank you for this challenging article. It set my imagination spinning as I think of how I would go about a more realistic approach that trumps the left/right way we tend to do politics. I do think that the Church not only through it's leaders i.e. bishops, but through it's institutional expertise could contribute a lot to the public discourse. I think of our Catholic Universities and colleges becoming real centers of research. Our schools could beocme hotbed of educational reform. Our social services could become models for care. To have that happen we need to give a new voice to what we do along with the voice that too often is just a statement. Ivan you deliver a well-thought-out and perceptive challenge to all of us readers, enriching your apologetics with superb reasoning and historical perspective. I am grateful for your writing, the healing yet provocative nature of your suggestions, and the clarity with which you write. I am not very familiar with Catholic thought, but having spent 4 months at the Collegeville Institute for Ecumenical and Cultural Research, and keeping my eyes, ears, and heart open, I have observed what seems to be a divide inside the church along U.S. political lines (at least in middle Minnesota). This last political season made it quite clear to an outsider, that the church is throwing its weight behind political sides. Your suggestion of a third way is very timely indeed. Thank you, Mr. Kauffman. Your article reminded me of the process our U.S. Bishops created for the writing of the pastoral letters on peace and the economy. By engaging with experts across all divides they were able to produce living documents which at their root were transformational. This approach came to a grinding halt with the attempt to write a pastoral on women in the church. Rome intervened and that was the end of this socially fruitful and collegial approach. It seems that ever since our national conference of bishops remains ruled by fear of this kind of intervention--not without some cause. Perhaps it is time for some leadership to emerge once again within our USCCB which will resurrect that process. Their impulse was a good one-engage the best thinkers and practitioners across the divides within church and society in a process which it's very nature holds the promise of transcending and transforming. This article also appeared in print, under the headline "After Ideology," in the December 10, 2012 issue. Ivan J. Kauffman is an independent author in residence at The Michael Sattler House near Saint John’s Abbey in Collegeville, Minn. His most recent book is “Follow Me”: A History of Christian Intentionality (2009).